Back in the mid 80's, while I was working for CN Railway, I happened to see an Ashley, Drew and Northern Railway boxcar in the yard. I thought that I’d find out a little bit more about my namesake railway. I grabbed the latest edition of The Official Equipment Register, and looked up the AD&N. While thumbing through the book, I stumbled upon the McCRRR, and noticed they were in California. I thought that they would be fun to model, and I could almost model the entire fleet. I started to collect all the HO, 60ft. double door boxcars that I could find. But, needless to say, the Official Equipment register didn’t say anything about Shays and Skeletons! 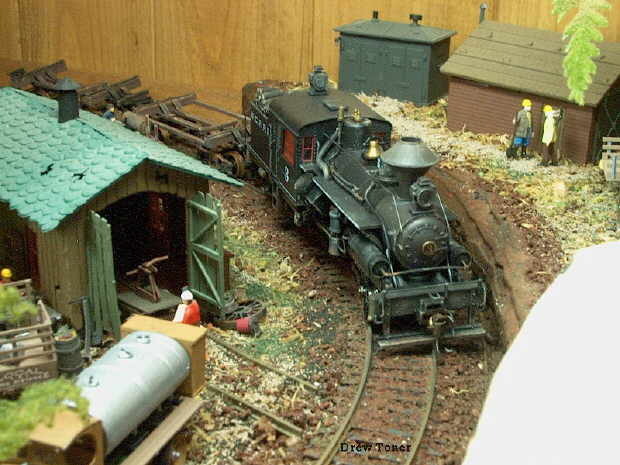 I spent many years working on collecting information about the McCloud Railway. We even took two trips to the McCloud Ca area, took a million pictures, and a brought back a bread bag full of the red ballast. I would collect any information that was related, and I started building the kit models. I built a 4 X 8 layout, with the help of a friend, Robert McAllister. He was the son of a railway modeler, and an electronics guru. The layout wasn’t much to look at, but it functioned well, had lots of switching, and a large shop area. Well time went on, the 4 X 8 was dismantled, and all the equipment was stored in boxes. About ten years later, after we settled again, I finally got the opportunity to get the models out. The computer was a little bit more of a daily feature, and I met some other McCloud River fans on the internet. One particular fellow was instrumental in getting the Ash Creek up and running. He went out and found a used copy of Pine across the Mountain, and shipped it to me up here in Alberta. Well, now I was hooked on the old time McCloud. I just love the old west era, and would love to have been around then. Suddenly I had a ton of work to do, building all this old logging equipment. I didn’t have much space, so the old, short cars would be ideal. 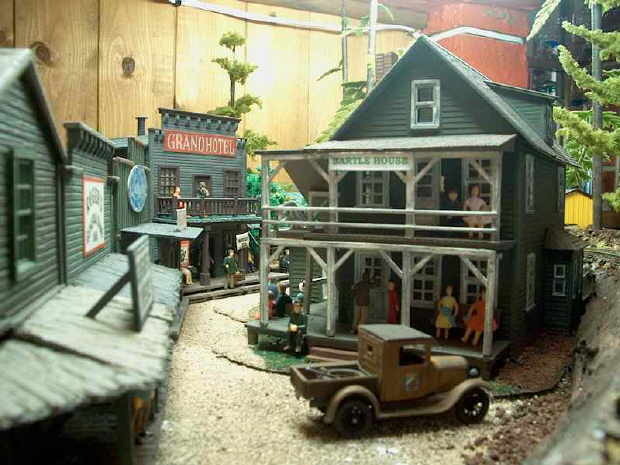 The old west would be fun to scratch build, as a lot of the old cars and buildings were in fact all built by hand. I was in scratch built heaven! I new I couldn’t build ‘the’ McCloud River in its entirety, so I had to come up with a portion, of the McCloud, that I could handle. The Pine across the Mountain book was the key, and the Ash Creek was born! 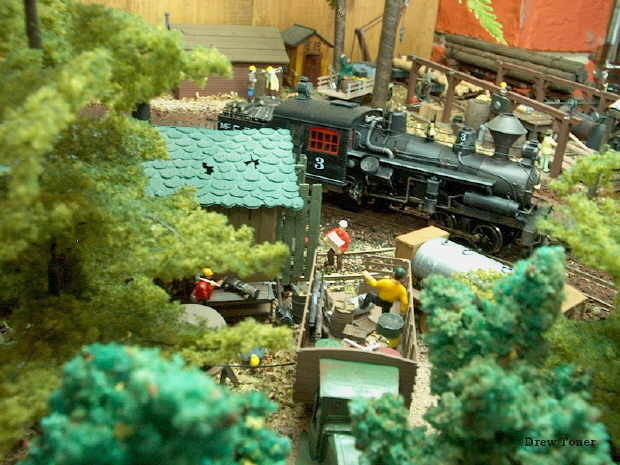 The totally freelanced, Ash Creek Lumber Co. is my interpretation of the McCloud River. I must admit, that I was a bit overwhelmed by all the scratch building that was ahead of me. I wasn’t really sure how to start. Then I stumbled upon the Badger Creek and was introduced to Paul Templar. His website, with all the tutorials, was the trick. It is what got me to the point where I am today. I was amazed at how simple Paul made it sound, but he was right. I couldn’t have built the Ash Creek, as it is today, with out his inspiration. 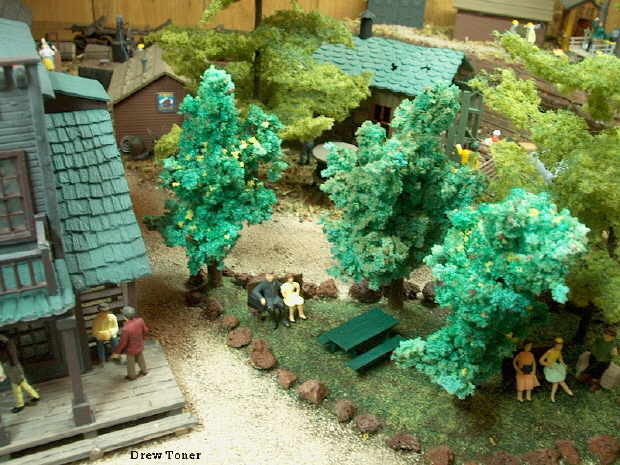 So it just goes to show, that the hobby of model railroading, is all about the friends along the way. I hope that every one can find something to work towards, and with a little help from your friends, you too, can reach your goals! All photos are by and courtesy of Drew Toner. 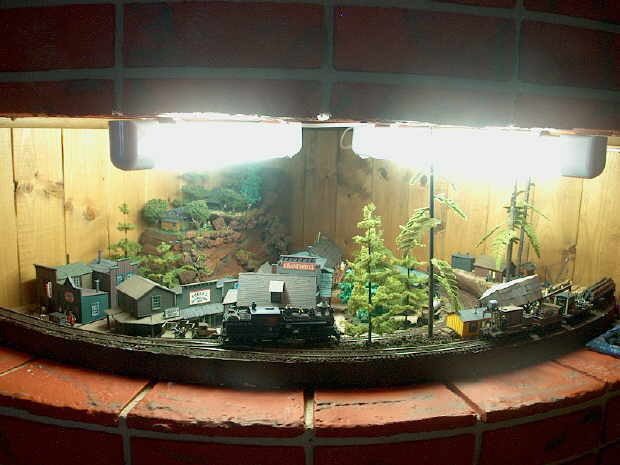 This is an overview of the Ash Creek Layout. The following photos show how much detail can be packed in this size of space. Logo of the Ash Creek Lumber Company, modified from the McCloud logo. Bartle House, social center of the Ash Creek Lumber Company. To view next page of Drew Toner photographs, click here.